- Monthly billiard instructionals to improve your pool game - with top players like Nick Varner, Jeanette Lee and Mark Wilson. - Pool tournament coverage to keep you updated on the progress of your favorite stars, plus a schedule of all pool events on TV. - Features on pool accessories and equipment, including pool cues, pool tables, instruction aids and more. - Profiles of the best up-and-coming pool players. - Columns by the best writers in pool: Untold Stories by R.A. Dyer, uncovering new material on legends like Willie Mosconi and Minnesota Fats; and Chronicles by Mike Shamos, examining the roots of cue sports and culture. - Industry analyses to keep you informed of the sport's business side. - Annual issues featuring the best new pool rooms and billiard parlors, web sites, and pool gear. 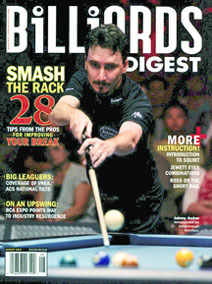 Begin receiving the best magazine in billiards! Choose the option that suits you best. The buttons in this column are for U.S. residents only. The buttons in this column are for international orders. As shipping is handled differently. * Use this button if you want your subscription to automatically renew in the future. * Use this button if you want your subscription to automatically renew in the future.